I went out on a walk seeking a simple photo of a mountain to use in a class assignment. We have plenty of mountains where I live (I can see one from my back deck), but it’s good to try some different shots. Getting to this ridge means walking a steep dirt driveway to a new age church property; they lack a “no trespassing” sign and but there is one saying the bookstore is open 8am-4pm (I was later). But I have never seen anyone up there, and if I skirt the edge of the buildings, I know there is a gate leading to National Forest land. The other fun factor is we still have a lot of snow from last week’s bis storm, the cold temps have kept it frozen. It was a fun trek to break trail with my dog, Felix. I know from past excursions there are good views along a road where the telephone and power lines run. The light was not good on Strawberry Mountain but was good on the one that is maybe an outlier of the top of the Mogollon Rim, between Strawberry and Pine. Right when I got to a good spot where the jeep trail drops a bit, I noticed a fat clear icicle just laying in the snow. I thought it might make a good photo jammed into the snow, but when I looked at the mountain, I wondered about a picture right through the icicle. The photo above was the best of three I took, because of the way the rounded top of the mountain was optically pinched inside the icicle. 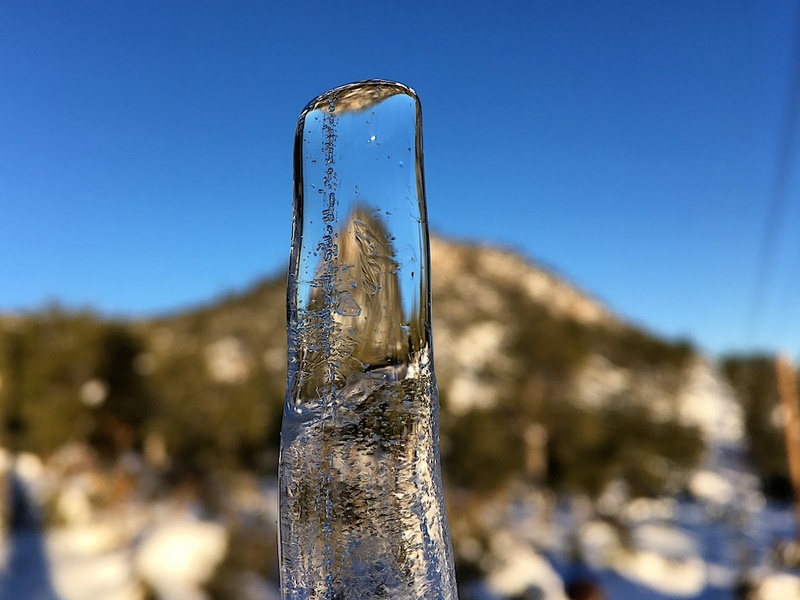 This was taken with an iPhone6 — I’ve found if I get close to an object like the icicle and lock the focus (it probably will focus in, but habits don’t die well) that I can get a shallow depth of field effect, hence the mountain is blurred. The cracks in the icicle look sharp, and the image suggests the mountain might be trapped inside of the ice. I posted the picture to flickr and got a fair number of views, two comments, then last night I saw a burst of likes. Yep, this one got flickr explore — I got a snapshot of the in explore group page with my photo on top. Another in explore, my 13th. 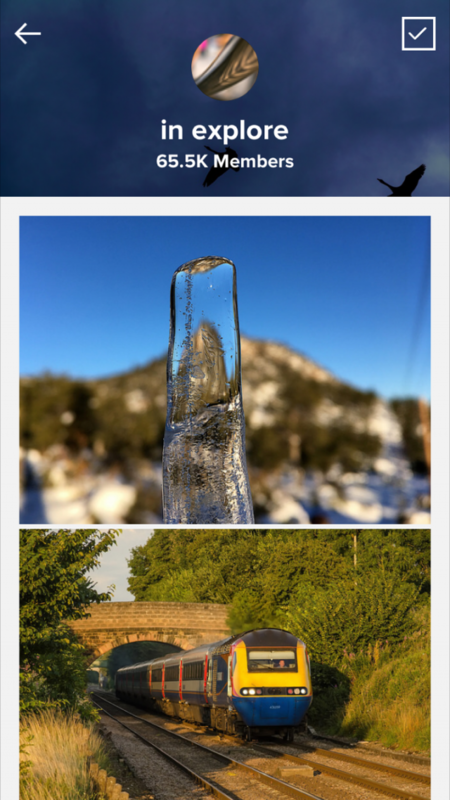 Just from picking up an icicle and experimenting…. Inside the Photo – Barking Dog Studio is the part of my photo gallery site where, on selected photos I write about what went into creating the image, sort of like a DVD extra. Congratulations! I noted this great photo in Instagram when out prowling on my own explore.